A couple of weeks ago we reported that PlayStation: The Official Magazine would see its last issue roll off the presses this holiday season. Publishing house Future wasn’t done there, however, as they also axed a few more gaming magazines in the process including British-based Xbox World and PSM3. Not wanting to disappoint fans, the editor in chief of Xbox World decided to go out with a bang by releasing some new details about Microsoft’s upcoming Xbox 720. And by new details, we mean a full 8-page feature on the gaming console. Editor in chief Dan Dawkins told CVG that his publication has been at the cutting edge of Durango (codename for the 720) coverage for the past 12 months. He feels that unless something drastic happens, everything they reveal in the magazine’s final issue will be what we see at E3 next June. The magazine says that current developer kits have four hardware cores with each one being divided into four logical cores. The early systems also reportedly carry 8GB of RAM, the same capacity that Sony’s PlayStation 4 could end up with. The final product is expected to ship with directional audio, Kinect 2.0, Blu-ray disc support, TV-in and –out, a new innovative gamepad and at some point, augmented reality complete with supporting glasses. 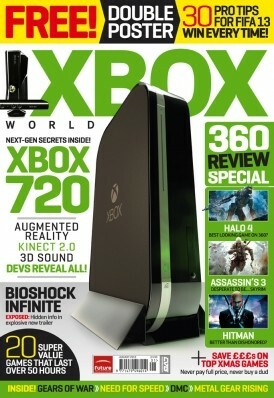 The publication doesn’t believe that Xbox 720 will be actual name of the console. Instead, they seem to think that simply “Xbox” will do. Either way, we should likely know the full details by the middle of next year at E3.